Since the publication of Wells’ The Time Machine in 1895, public fascination with time travel has resulted in hundreds of pulp fiction books, movies, and television shows some of which were extraordinary, many of which were good, most of which were just plain silly. TimeRiders is one of the extraordinary ones. Wells’ novella spanned a single time line from 1895 to the year 802. Scarrow limits his scope to the years between 1912 and 2026, and juggles four separate time-lines keeping each distinct, causally credible and consistent. No small feat, that! Liam O’Connor is a steward on the Titanic in the year 1912 when Foster appears to him below deck just as the ship is about to sink. He is offered a choice to stay and die or become a part of his team. Maddy Carter is approached in the year 2010 moments before the plane she is flying in is about to explode due to a terrorist attack. She is offered the same choice. Salena Vikram is likewise saved from a burning building in Mumbai, India, in the year 2026 during one of the endless wars between India and Pakistan. They were chosen at the moments of their deaths because their disappearances would not alter history in any way. Each of these team members has a talent: Maddy for technology, Liam for courage and decisiveness, and Sal, perhaps the most important in the team, is gifted with strong powers of observation. Having been saved, they are now cursed with living the same two days in history over and over again in a continual loop: September 10 and 11, 2001. It would be easy to fault the author for exploiting those particular days, but Foster explains those days were specifically chosen because the attention of the entire world would be focused elsewhere, and the comings and goings of time travelers would go completely unnoticed. Sal is charged with memorizing everything, the smallest details of those two days so she can detect when any one of them is different. If a baby drops a rattle one day and does not the next, then something is amiss. She can knows by these observations when the correct time-line has been changed and the team must find out when and where the alteration occurred so Liam can return to that time and correct it. One day, the scene is vastly different. Instead of reliving again the destruction of the World Trade Center by two airliners, Sal is surprised by a time-wave that crashes through the city and creates an entirely different world. “She closed her eyes. Foster probably wouldn’t approve of that if he knew, but there were only so many times she could bring herself to watch. She could hear the plane now. “Then she felt it: a dizzying sense of losing balance, of falling, as if just for a moment the ground beneath her had been whipped away. The Twin Towers are gone. They have never been built. The city looks different: more standardized and ordered, less exuberant. Clearly, time has made a wrong turn. Everywhere are symbols of the Nazi Party. Paul Kramer is an authoritarian utopian visionary from the year 2066 who goes back in time, with a commando strike force equipped with advanced weaponry, to alter the results of WWII so that Germany wins. But there has never been a template for Utopia—from Plato to More to Marx—that did not cost the individual his freedom. Kramer is willing to sacrifice that freedom for a more ordered world free of war, pollution, and crime, where people can live in safety and peace. Kramer could be anyone who is afraid of the damage that we as a species have visited on our world, anyone who has longed for more order, less chaos, anyone who has wondered why another group or segment of the population just doesn’t seem to get it. All of these who would impose their will on others are potential Kramers. His was an act that was done with the best of intentions, even laudable motives. However, it is clear that the best of motives can often translate into the worst of outcomes. Believing his utopia to be doomed, Kramer destroys it, creating the third time-line, a post apocalyptic world where buildings lie in ruins and human beings are reduced to skeletal cannibals. These time-lines must be corrected; nothing less than the future of the planet hangs in the balance. Liam and his artificially created android partner, whom the team has dubbed “Bob,” travel back in time to discover when Kramer altered time and intercept him, if they can, before he is able to take over the Third Reich and help it defeat the Allies. 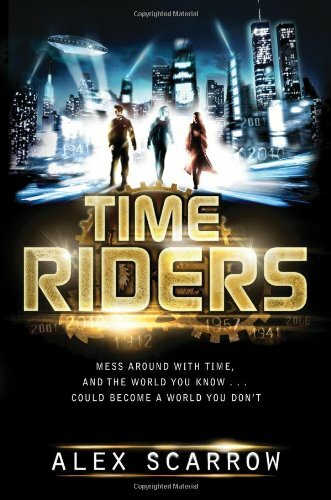 If TimeRiders were only a compelling action adventure, it would be enough for Scarrow’s target audience, but there are philosophical underpinnings that give it depth, questions about how myths develop, where religions come from and what the moral implications are of being able to prevent disasters and not doing so even at the cost of thousands of lives, and what exactly is the “true” time-line. Who decides which history is the correct one? Alex Scarrow has written a marvelously compelling adventure that succeeds not only as a thriller, but also as an elucidation of ethics, history, the role of government, and the responsibilities of freedom. In the tradition of H. G. Wells, this is young adult science fiction that transcends its genre.